I then asked him a follow-up question about how he plans to cover his long-term care needs. “I do not think I will require such care, but if I do—I will cross the bridge when I get to it,” he said. The asset-allocation rule is outdated. It suggests that you decrease the stock allocation of your portfolio and increase your share of so-called safe investments (such as bonds or certificates of deposit) as you age. The rationale was two-fold: 1) As you age, you have less time to grow your money or to recover from a loss, and 2) the “safer” investments are safe, yet provide better returns than inflation. Rather than blindly following these general rules of thumb, you’re better off figuring out the numbers and plans that best fit your specific situation. Develop a customized retirement budget with a detailed breakdown of expected expenses. Based on that budget and your life expectancy (which you can estimate using calculators such as the living to 100 calculator), calculate what you’ll realistically need for your retirement nest egg (as opposed to shooting randomly for an even $1 million). 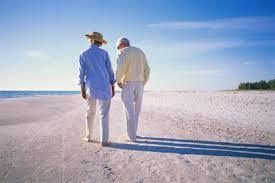 Finally, seek professional help for your retirement portfolio management and distribution needs.